Japanese Title: キッチンのお姫様 〜天使のケーキを探せ!〜 — Kitchen no Ohimesama: Tenshi no Cake wo Sagase! 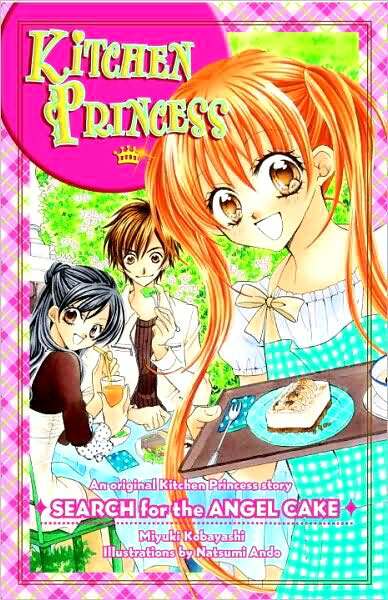 Synopsis: For all the fans who can’t get enough of the smash hit manga Kitchen Princess–a thrilling new prose story of romance and adventure! Najika faces a new challenge, and it may be her toughest one yet. Before their tragic accident, her parents, both famous pastry chefs, made a promise to the grandmother of a classmate of Najika’s: to duplicate a white cake the elderly woman once tasted abroad as a teenager. Now Najika hopes to re-create the cake herself. With so few clues (it’s fluffy and heavenly) and so many possibilities, the trial and error might just go on forever. But Najika refuses to give up–for one reason: She knows that all great masterpieces contain a distinct magic: a secret ingredient called love. Najika will need lots of it to make the wishes of Anju’s grandmother–and certain other classmates–come true. And who knows? With so much amour in the air, Najika might just find a little left over for herself! Any broken links or incorrect information? Any thoughts on this light novel?